I’ve been hoping and praying for a particular situation for quite some time now, and earlier this week, I received news about that prayer request. While the outcome of the prayer has yet to be revealed, I feel that God is steering me in the direction to where concrete answers can be found. I am thankful for hope and faith. I am grateful that I dare to hope for something seemingly impossible and am humble enough to acknowledge that He holds the world in His hands, including my world and my prayer requests. I have faith that He hears my prayers and will uncover the answer in His perfect timing. 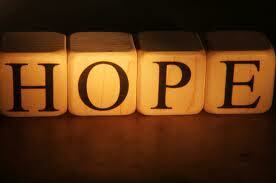 I am thankful for the hope that You give me and for the growing faith that lies within me. I pray that my faith will continue to increase and be a reflection of the trust that I have in You. In Jesus’ name, Amen!